Join Captain Bill for an information-packed seminar on reeling in King and Spanish Mackerel. Captain Bill will show you fishing targets and fishing methods to be successful! Plus, he'll show you some must-have items you need in your tackle box. Our welcoming lobby is designed to resemble an old Florida trophy room, and features native fish and wildlife mounts from Florida, plus vintage photographs and antique artifacts. Hand-painted murals wrap the store’s interior, and both children and adults enjoy the animal tracks that are imprinted in the concrete floor of our 130,000-square-foot store. We offer customers an assortment of high-quality apparel and gear featuring top industry brands. We provide items for adventures in Fishing, Hunting, Hiking and Camping--as well as apparel, footwear, gifts and items for grilling and relaxing in your own backyard. Our friendly and knowledgeable Associates will assist you in making the right choices of products for your adventure. The store’s 9,800-square-foot Tracker Boat showroom features MAKO saltwater boats, Nitro high-performance fishing boats, Sun Tracker and Regency pontoon boats, Tahoe pleasure boats and Tracker fishing boats. Plus, onsite service bays allow customers to get their boats rigged, serviced and maintained by our skilled team of Power Pros. FREE workshops are always a part of our events and happenings at the store. We offer seminars from bowfishing to barbecuing and everything in between! Our hunting and fishing events always include info-packed seminars with our in-store and local pros. Our 11,000-gallon freshwater aquarium was constructed to look like a sinkhole with water pouring into it, and is surrounded by various wildlife mounts and exhibits. The aquarium is filled with largemouth bass, hybrid striped bass, longnose gar, Florida gar, bowfin, catfish, and redfish—yes, those are redfish in there that have been acclimated to live in the freshwater aquarium. The store also features the Islamorada Fish Company, which began in 1948 as a marina snack bar in the Florida Keys offering the freshest fish possible at a reasonable price. The 8,000-square-foot restaurant at our store offers a wide variety of fresh seafood and steak entrees—and a 2,000-gallon saltwater aquarium in the restaurant’s lobby. Looking for something fun and educational for your scout troop, fishing or hunting club to do? Consider combining a tour with a delicious visit to our Islamorada Fish Company Restaurant. Please contact our Restaurant Manager directly at 813-655-2000 to schedule. Throughout the year, we hold many special events such as the Spring Fishing Classic, the Fall Hunting Classic, Go Outdoors camping event, Hometown Festival, Halloween Pumpkin Patch, Dog Days, Easter Event and Family Summer Camp. Starting in mid-November each year, Bass Pro Shops welcomes Santa Claus to our store, and we transform our Tracker Boat showroom into Santa’s Wonderland—a fun and magical place for your family to enjoy free pictures, crafts, fun and games. Schools or groups can contact Cheryl at cakehrmeyer@basspro.com to plan a visit. We enjoy sharing our love of the Great Outdoors with our local Boy and Girl Scouts, so we work with our local troops to support their fundraising and educational activities. Please email cakehrmeyer@basspro.com for details, and for schedules on our September Merit Badge Classes. Thanks for your organization’s efforts in our community! 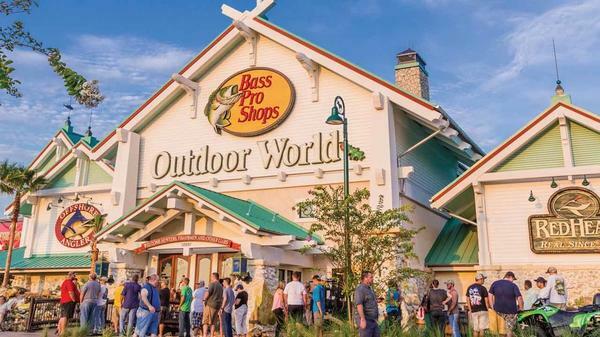 Bass Pro Shops has identified key areas where our giving can make the most impact in conservation and community. Please visit www.basspro.com/community to submit an application. Your request will be reviewed, and you should receive notification in 4-6 weeks. We look forward to welcoming you to our store and restaurant soon!